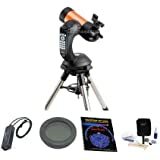 Celestron Deluxe Mars Observing Telescope Accessory Kit, Get Ready to See Mars! Select from a database of more than 40,000 stars, galaxies, nebulae, star clusters, solar system objects, & more. Your NexStar SE locates them all with pinpoint accuracy & tracks them automatically. The 4SE is ideal for weekend camping trips or excursions to dark sky sites. Its compact form factor is easy to transport and assemble just about anywhere. 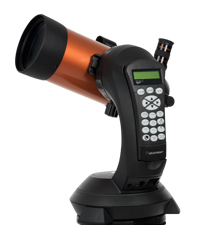 You receive a red dot StarPointer finderscope, 25mm Plossl eyepiece, visual back, and mirror star diagonal. The 4" primary mirror is offers enough light gathering ability to see the best of the solar system & beyond: Saturn’s rings, Jupiter’s cloud bands, details on the Moon, & brighter deep sky objects. Budding astroimagers can use the built-in wedge to polar align NexStar SE. 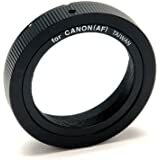 Using simple, inexpensive adapters, connect your DSLR or astronomical camera & capture your own images of celestial objects! Compatible with all Celestron’s most popular accessories, including StarSense AutoAlign and SkyPortal WiFi Module, the NexStar SE can grow with you. Celestron’s proprietary SkyAlign procedure has you ready to observe in minutes. Center any three bright objects in the eyepiece and NexStar SE aligns to the night sky, ready to locate thousands of stars, galaxies, and more. View the Universe’s Most Impressive Celestial Objects The 4SE’s four-inch primary mirror packs enough light-gathering ability to observe the best that the solar system has to offer: Saturn’s rings, the cloud bands on Jupiter, and geographic features on the surface of the Moon. When it comes to deep sky objects, take your 4SE to a dark-sky site and you’ll see hundreds of pinpoint stars in the Hercules Globular Cluster, the spiral arms of the Whirlpool Galaxy, and more. Revolutionary Single Fork Arm Mount We know the best telescope is the one you will use most often. That’s why Celestron’s engineers created NexStar SE’s unique, patented single fork arm mount. It’s perfectly portable and makes setup quick and easy. What’s more, the NexStar SE breaks down into several lightweight and compact pieces, making it easy to transport, even in small vehicles. You’ll have no problem getting the NexStar SE to your favorite observing site, or setting it up quickly in your backyard. Of course, it’s what’s inside the mount that really counts. Sturdy construction from high-quality components give NexStar SE the pointing and tracking accuracy needed to observe and follow your favorite targets with push-button ease. 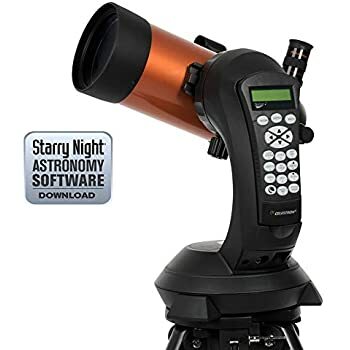 Use the included NexStar+ hand control to locate over 40,000 celestial objects, or take a Sky Tour and let your telescope show you the best objects currently visible. 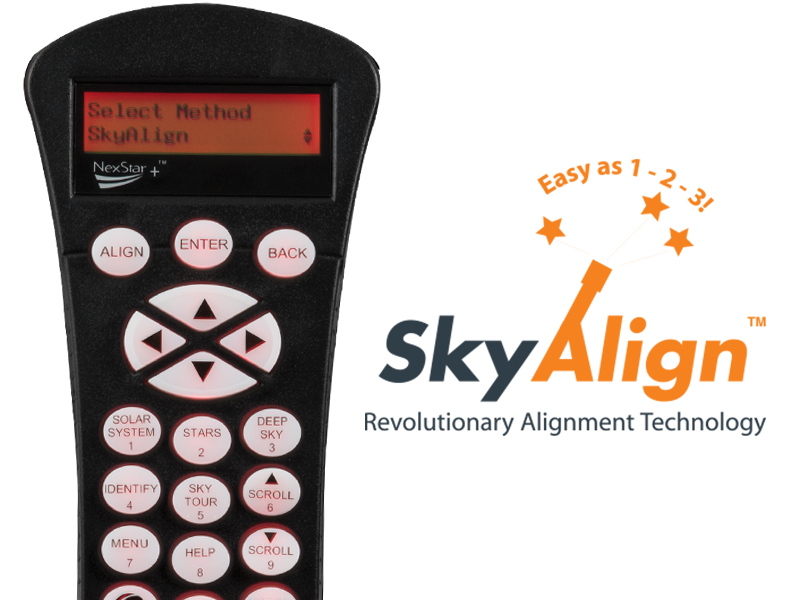 Aligning your telescope is simple and painless, too, thanks to SkyAlign. This process makes alignment as easy as 1-2-3: just center three bright objects in your eyepiece and press ALIGN. For even easier alignment, attach our StarSense AutoAlign and your NexStar SE aligns itself! Advanced Features Let the NexStar SE Grow with You The NexStar SE is compatible with all the high-tech accessories advanced users love. Provide GPS coordinates to your telescope with SkySync, or add automatic alignment functionality with StarSense AutoAlign. Its built-in wedge allows you to track long exposures. 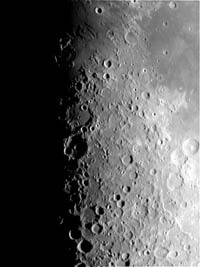 if you’re interested in imaging the Moon and planets, pair your NexStar 4SE with one of our Skyris cameras. 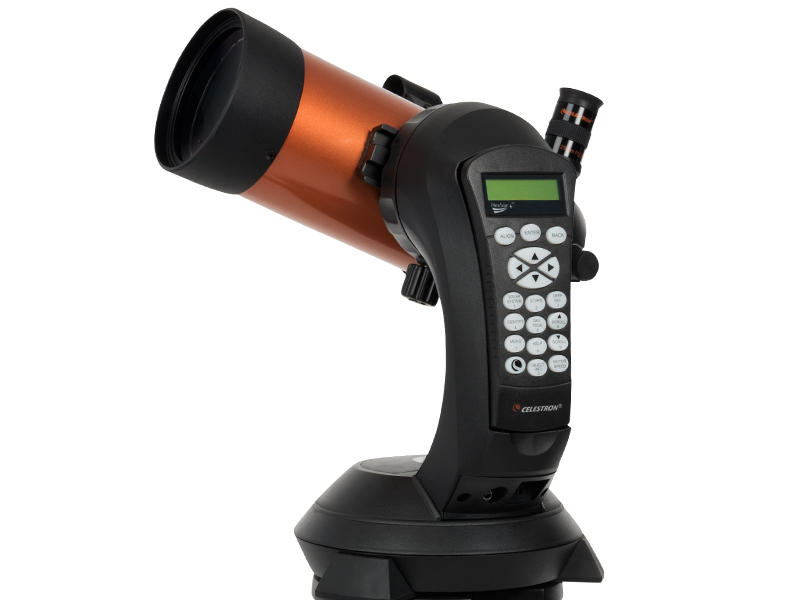 From your first observing session and for years to come, the NexStar SE is your trusted companion. 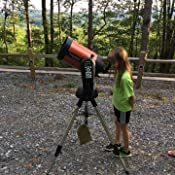 Amazon.com Review Celestron’s NexStar 4 SE is the smallest and most portable telescope in Celestron’s NexStar SE series. 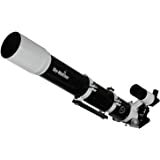 Using a Maksutov-Cassegrain optical design, the NexStar 4 SE puts the magnifying power of a four foot long telescope into an optical tube only 13 inches long. 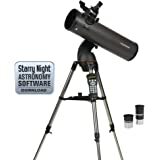 This is a GREAT telescope. Don't let other reviews or Youtube videos try to convince you that you should go with the 5" or 6" since they are smaller and more portable...light gathering ability is EVERYTHING in a telescope, and the 8" gathers ~78% more light than the 6SE model. 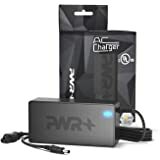 1) Either an AC adapter to power the scope or a Celestron "PowerTank" or a car or motorcycle battery with a car adapter cord to plug in to your telescope. 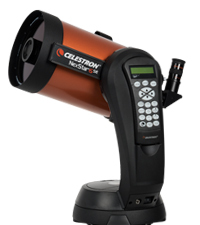 I have the Celestron Power Tank 17. The power tank uses cigarette lighter style power cords which you can also plug into your car's dashboard if observing remotely next to your vehicle and you buy the car adapter. Although the scope can run on AA batteries, it will eat them up in less than an hour, rendering the scope slow and eventually unusable. 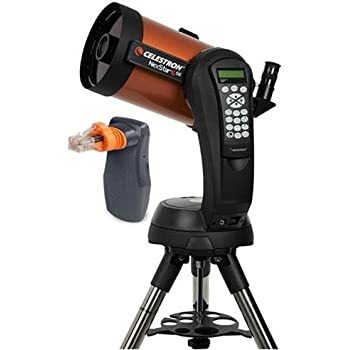 2) Buy a dew shield (Celestron #940009 for 8" scopes) , which is only $23.00 or so...that will keep the night dew from forming on the front of the telescope's "corrector" (the front of the telescope) as the temperature drops at night. The above is the bare minimum I would order if buying this telescope. Anything less will adversely impact the enjoyment of it. Expectation management: With the above, yes, in the summer in the Northern hemisphere, you can see the rings of Saturn and you can clearly make out Jupiter. It will blow your mind if you've never seen those planets with your own eyes. However, don't expect to see great detail and have the image fill up the view as some of the pictures in these reviews indicate. The human eye cannot see the color and detail that a long exposure (30 seconds or so) can reveal when you hook a camera up to this telescope. You will immediately want some eyepieces that allow you to zoom in further, so let me help you with that process. I strongly recommend that you buy a 2" diagonal and eyepiece setup. Again, the scope, out of the box, only comes with a single 25MM 1.25" eyepiece, which has a narrow field of view and not enough magnification to really enjoy your first astonishing views that get you hooked on astronomy, like looking at Saturn and seeing the gaps in the rings. 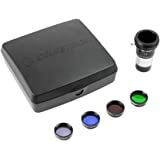 Celestron sells a kit that has a diagonal, 2X Barlow Lens and three 2" eyepieces (Kit #94305 - $300.00). 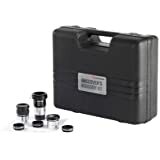 You can buy that for starters to get you going with 2" eyepieces at the lowest cost. 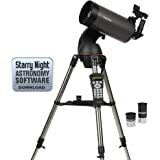 If you have the financial means to "do it all right the first time" without buying the same type of things twice, I would recommend that - instead of buying the 2" starter kit - you buy the Celestron 93527 2" diagonal, which has the Starbright XLT coatings and can be used with 2" eyepieces as well as the 1.25" eyepiece that comes with the telescope, the Celestron Luminos 2.5X Barlow lens (#93436) which will allow you to more than double your magnification with any eyepiece, and some better eyepieces. 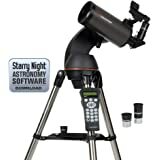 If money is no object, buy TeleVue. They are the high-end in the telescope world. Around $300-$800 each depending on what you choose. If you are going to spend that kind of money, join the CloudyNights forum and get some custom-tailored recommendations from other TeleVue users. I'm going to stick to cheaper (but still good) products that are well respected and a good value. First eyepiece: Meade Instruments Ultra Wide Angle 20mm 2-Inch Waterproof Eyepiece (7743), which you can get here on Amazon for around $120. With the aforementioned Barlow adapter, that will give you 20 MM and 8MM views. Second eyepiece: Explore Scientific 82° 30MM eyepiece. In order to use it, you will have to add a longer dove-tail rail to your telescope to move the scope farther forward in the mount to balance it out.I use an ADM V Series Extra Long (VC-8XL). I had to cut the aft mount bracket to make it fit on this telescope. With the 2.5 Barlow, that gives you 30 and 15MM views. You can buy Celestron Luminos eyepieces, but they sometimes suffer from Edge Of Field Brightness (EOFB) which some astronomers find distracting. If you go with Luminos, buy the 19MM and 23MM. I own those two, but they are not as good as the other two I recommended. If you did not know it, in the telescope world, the smaller MM eyepeice means more zoom-in (greater magnification). You divide the focal length of the scope (2032MM for the Nexstar 8SE) by the eyepiece MM to get the zoom...Example: 2032/19 = 107x. 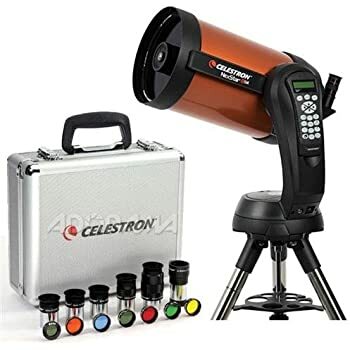 You can use the diagonal and eyepieces I have recommended with larger Celestron telescopes should you upgrade in the future to an even larger telescope (I have a Celestron C11 on a CG5-ASGT mount as well). 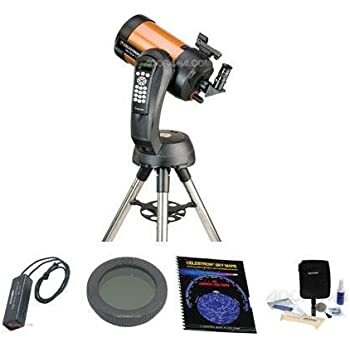 This scope is perfect for a beginner, can be set-up in about 10 minutes, and aligns easily by pointing to three bright objects in the sky. It is the ultimate "grab-n-go" telescope. It is NOT ideal for astro-photography, as it is an Altitude/Azimuth (ALT/AZ) telescope and BOTH motors must run at the same time to track an object, which is not as precise as a German Equatorial Mount (GEM) where only one motor has to run to track an object. GEM's require polar alignment, which is a bit complex for the beginner. If a bigger easy-to-use ALT/AZ scope is wanted, the next step up from the 8SE would be the CPC Deluxe 925HD (9.25") or CPC 1100 series (11")...or if you get into Astronomy and astro-photography, jump to a GEM telescope. 4 Stars since it does not include an AC adapter or DC cigarette lighter cord out-of-the-box. With those items, I'd give it 5! 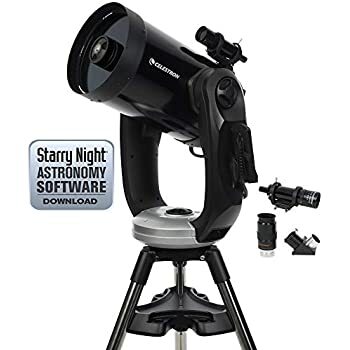 5.0 out of 5 starsGreat Telescope. 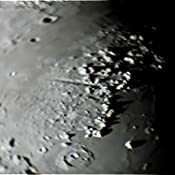 Great Telescope for 3 years now. I bought the 5" for the polar alignment feature. There are many good reviews on here about the scope already. So, I'll just say that you don't really 'see' what these images show, you need a decent camera and a computer to process your photos into stunning images. 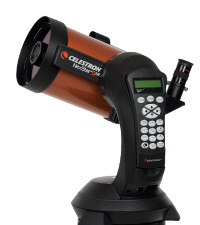 I would also suggest getting the Celestron Star Sense Auto Align, it will save time and that means more viewing. The Orion Nebula was shot with a Sony A6000 at 30 Sec ISO3200 using a Celestron 94123 1.25-Inch UHC/LPR Filter and is a single image. 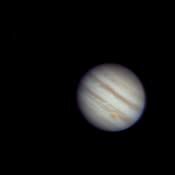 Jupiter was created from a series of video frames shot with the Celestron NexImage 5. 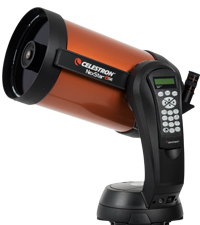 The Celestron Nexstar 6se Telescope is fun, big and heavy, powerful, and really good optics. The night I first used it I used the Skyalign alignment and worked perfectly along with auto 2 star alignment. That night I saw Saturn In really good detail, and what was surprising was I was able to see Swan Nebula and Hercules Cluster all from a heavy light polluted sky. I live in a very heavy light polluted sky and no deep sky objects are visible to the naked eye. 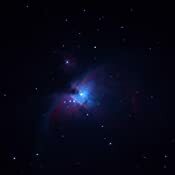 But when I look through the telescope I see the Orion Nebula(M42) very bright and clear. But when I type in Dumbbell Nebula(M27) I don't see a thing except several tens of stars. To see it you have to image it, I took 10 images 10 second exposure each (10x10s) and stacked them for a total of 100 second exposure . The Nebula was big, bright, and colorful(you can see the image in the product image gallery). So to see brighter/faint deep sky objects in a light polluted sky you have to image them with a camera. the faintest thing I have ever detected in any image is about magnitude 12(244 times fainter you can ever see with the naked eye).